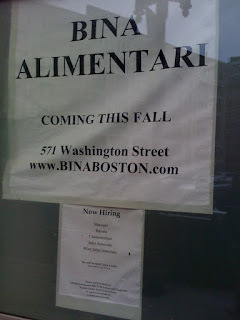 By request from Bloggery Reader Keith, I swung by Bina Osteria and Bina Alimentari to check up on their progress. For those of you that missed the first post, you can check it out (here). The doors are still frosted over so you can't see much, but you can tell that they're doing some pretty heavy duty construction in there. 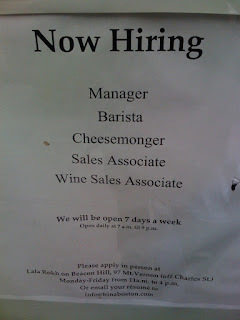 Also, they've posted a couple of new "for hire" signs. Here's a couple of shots I took of one of the store fronts, Bina Alimentari. 0 Response to "1000 Words - Bina Boston Update"